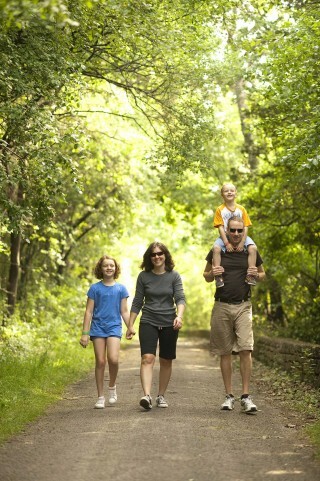 Abundant with wildlife, unique geological formations and spectacular lake views, Green Lake’s hiking and biking trails are some of the best public access trails in Wisconsin. The varied terrain offers an amazing experience for outdoor enthusiasts of every level, during any time of the year! Explore the natural beauty of Green Lake on one of the many public hiking trails. Maintained by the Green Team (a collaboration of the Green Lake Conservancy, the Green Lake Association, and the Green Lake Sanitary District), the hiking trails in Green Lake enable trail users of every level and endurance to take in the natural beauty of Wisconsin at its best. Hammers Trail (0.6mi) features five bridges over several creeks and springs; Norwegian Bay Boardwalk (0.6mi) leads users through the largest area of contiguous wetlands to the shore of Green Lake; Winnebago Trail Conservancy (0.9mi) is a former Native American trail that follows the elevated shoreline for spectacular views of Green Lake; Tuleta Hill Prairie Trail (0.5 mi) winds through restored farmland; Sunnyside Conservancy Trail (1.5mi) features level terrain through woods and scenic panorama of the County K Estuary; Pool’s Hill Nature Preserve and Sugar Island Wetlands offer open exploration of wetlands with woods (no trail) and are only accessible by water; Mitchells Glen (0.5mi) is a steep-sided and timbered gorge with unique geological formations and a spring-fed stream (guided tours only). Hiking trail guides can be obtained at the Green Lake Chamber of Commerce or online. Located at 361 Lake Street (the corner of Lake Street & Illinois Avenue). From this vantage point you’ll see native plantings, a meandering path, memorial benches and stunning lake views. Dawson Prairie encompasses 54 acres of restored land. Mowed trails wind through over 100 species of native grasses and wildflowers, blooming late spring through September. Abundant wildlife including deer, birds and butterflies inhabit the prairie. A .6 mile public trail located within the Assembly Creek and Springs conservancy property built in memory of Brian Hamming. Walk the trail and enjoy its beautiful surroundings as your time permits. A beautiful, steep shoreline trail travels along the West end of the lake. Once used by the Winnebago Indians, stroll down this historic lakeside path. Located off St. Marie Road & Swamp Road between Princeton Road and Co Hwy J. Take a leisurely walk through a rare and breathtaking habitat. Trail head stands are located at both entrances. Further information and a map are available at the Chamber Office. Located one mile north on Hwy 49. Enjoy a luxurious hiking experience by walking the mowed trails winding throughout these dramatic woods. Whether you prefer cycling along the waterfront or finding off-road biking adventures, the Green Lake area offers unique biking experiences for every level of cyclist. Loop the Lake (27mi) is a bike route that follows the perimeter of the lake. Made up of both paved (non-motorized) paths and low and high traffic roads, the Loop the Lake route will take you through some of the most picturesque scenery surrounding Wisconsin’s deepest natural lake. The City of Green Lake trail is a paved trail that runs along highway 23 from North Street to the Green Lake Conference Center. Plans to continue the trail to Ripon are underway. The part of the Mascoutin Valley State Park Trail that is publicly accessible in our community is approximately 11 miles in length (Berlin to Ripon) and stretches along the old Milwaukee rail bed. The base consists of crushed limestone and grass and the corridor is mostly shaded in the summer. The trail passes through farmland and a secluded valley among gently rolling hills with scattered ponds. For off-road adventure seekers, Ceresco Prairie Mountain Bike Trail at Ripon College provides the thrill of jumps and switchbacks along with a couple of nice climbs. The trail is built on the side of a hill and winds through hard woods and tall prairie grasses. The trail is open to fat-tire cycling during the winter. Off-road cyclists can also utilize the Guskey Miller Prairie Trail and the Sunnyside Conservancy Trail for off-road cycling in every season. Both trails feature fairly level terrain and a combination of prairie and hardwoods.